Please check out our additional patient reviews on Yelp and Google. THE BEST orthodontist ever! Please, if you need braces go here Dr. Velez is amazing! I just got my braces off and I love my smile so much! She’s amazing and her staff is always kind and very helpful and they are all willing to answer any questions and explain what they are doing. Can’t recommend this place enough I’m so happy I came here! Really recommend! Dr. Velez and her staff are awesome! I used to feel so embarrassed to smile and show my teeth and now I feel confident and love smiling thank you Dr. Velez! Friendly staff and prompt appointment times with little to no wait. Dr. Velez and staff are great! Looking forward to coming again. Before coming in with Dr. Velez, I was always afraid to smile. Now, after I got my braces off, I can’t stop smiling! Thank you Jose, Amy, Sabrina, Julia, Jharlin, Cristal, and, most importantly, Dr. Velez for making my journey with braces an enjoyable and memorable one. Definitely going to recommend family and friends. HIGHLY recommend this orthodontist if you’re looking for a Dr. and staff to truly treat you like your results matter. They all understand the value of your smile! I am not disappointed with my results. I was always greeted with smiles when I walked in. Don’t expect anything less than greatness from Dr. Velez and her wonderful staff! We were in a pickle and they totally saved the day!!! We are from Virginia but were in town for a funeral when my son's maxillary expander fell off on one side! He couldn't even eat. After getting "No" from a few others, this office took the time to call our orthodontist in VA and get permission. They agreed to help that day. The staff was so friendly and accommodating; wonderful chair-side manner from assistant and doctor. Special shout out to Sabrina and Jose for making it happen! Awesome people! Dr. Velez and her team are simply the best. Even though I was less than thrilled about wearing braces as an adult, I have zero regrets about choosing Apple Valley Orthodontics. I was always 100% confident that I was receiving expert care. Dr. Velez is personable and easy to talk to. I never felt embarrassed or apprehensive about asking questions or voicing my concerns. They were ALWAYS friendly and so efficient and professional. I moved forty miles away about halfway through my treatment, but I never considered switching facilities for a second. This place is too good! Even though I may have had to sit in terrible traffic to make an appointment from time to time, it was totally worth it. And if the top notch care wasn't enough, the office is immaculate! I definitely do not miss my braces, but I will miss this place! Awesome orthodontist. Dr. Velez and her staff is simply amazing. I’m so thankful for her and the whole office...both of my girls got there braces on today and are so happy, they did a wonderful job. The office is so pretty its top notch. Thank you for such a great experience, best in the high desert...we look forward to our ortho experience with Dr. Velez and her entire staff. I will continue to spread the word on how wonderful this office is....I can’t thank you all enough. We absolutely LOVED our experience with Dr. Velez and the whole staff! Our 3 daughters went here for braces and everyone was very kind and helpful, at every appointment. From start to finish, it was easy to make or change appointments and get extra supplies when needed. We will miss coming in every month. Thank you especially to Dr. Velez, Sabrina, Amy & Jose, for making this experience so great for our kids!! We love Dr. Velez and her staff! Our son had his braces done there and now we are back for our daughter. The staff is very friendly and they go above and beyond to make sure you have the best experience. It is evident with every visit that they truly care about the patient. 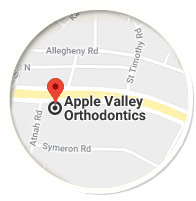 I highly recommend Apple Valley Orthodontics. We love Dr. Velez and her staff. They are very friendly and helpful. We've had 2 of our kids teeth straightened here and couldn't be happier. I have been with them for almost two and half years. And out of all that time I always felt welcomed I always felt like I was a part of their family they make sure you were comfortable you were happy with their work and if something felt a little off they would fix it for you when I first came in my smile was horrible then now that I have my retainers my smile is amazing unbelievable and no matter what they supported you get questions they would answer and I am very thankful with having them do my teeth because they came out amazing the staff there are the best they are funny but also very professional and they are very honest about their opinions every single one of them in there are amazing so thank you guys for everything. I highly recommend them to do your teeth for your children for you for whoever it is. Best orthodontist I have ever been to! The office is so nice and relaxing. There is internet, a coffee machine, and a television. My daughter only had her braces on for 2 years and they look phenomenal! The doctor is so nice along with the receptionists. I truly recommend! Our experience with this practice was wonderful. The staff was always welcoming, friendly, and knowledgeable. Their estimates on cost and time were right on. I would recommend this practice to anyone needing orthodontic work. Dr. Velez, Sabrina, Amy, Kiki and staff. So much Great stuff to say, my daughter had many bad experiences with shots and dental work that she is fearful to go to the dentist. On first visit for general exam, she fell in love with the personal and office staff, the personal attention she received, and the gratitude and appreciation they showed her for coming in. She had to lose 4 baby teeth before they could start, about 1 year later. She was so excited to go back and start the journey of braces that she kept her apt card and 1 year later it looked the same as when they gave it to her... as she counted down the months and days. When they were finally able to start, she had no fear as she was very comfortable and felt like they cared and would do no harm to her. They took the time to show and explain every step of the way as she asked many questions. Even gave her a go home starter kit with everything she needed to be successful in this 2 year journey. I have never witnessed her spend so much quality time and concern with her teeth as she does now. Thank you so much for a wonderful experience, and allowing my daughter to believe in herself and dental issues. You have probably changed the rest or her life in regards to dental care and her teeth. I'm sure the change will be for a lifetime, and due to just the little extra things the staff and Dr. have done for her. The office and staff are "priceless". Thank you for everything. You have my endorsement to all I encounter. Amazing Dr. and staff. My boys had a great experience and their teeth are beautiful. Dr. Monica is amazing! Always willing to answer my questions. I thought it was weird to go in as an adult but she assured me that it was never weird to want a great looking smile. Will definitely bring my kids here if they ever need her services. My daughter has had her complete orthodontia work done here. We have been extremely happy with the level of care, service, expertise, and price. I recommend them to everyone. Love love love this Ortho! Hated the dentist from childhood experiences and ever since going to Apple Valley Ortho I have overcome those memories. Love the receptionist and all the team members. Very professional and nice! Recommend 100%. Dr. Velez & Staff are Amazing & like family!!!! Our general office has been referring for years and I bring my own children. I have complete trust. You will not be disappointed with the whole experience and outcome of a Beautiful smile!!! !